The hilarity continues here on the blog! Some really great captions were submitted yesterday, and we agree with some of you in the comments that the latest winner is Rachel Velarde for her comment, "Help me Obi-wan Kenobi. You're my only hope." Who will win one of the remaining two t-shirts?! Leave your clever captions below! It's called a sword; I think you're supposed to use it with a fork. It says it right here on the blade. "Made in China". "Let's sell it on eBay and get something really nice for Erda's birthday." Yes: it is beautifully made but I was hoping for something a little more traditional: like a diamond ring. And you thought I was "Not Hung" ! It's the sacred sword of the Kennedys. Why don't you wrap the handle with some of my favorite government red tape? So this is really the sword that Arthur pulled from the stone?? It's self-sharpening and comes with a free set of steak knives! "I think it's sharp enough. Now, where's the beef?" 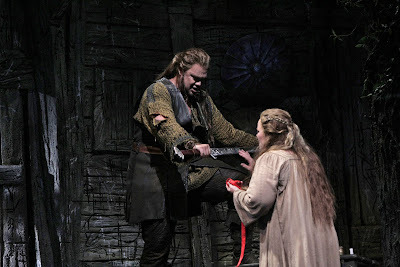 I wanted to use waterboarding on Hunding, but Wotan says that is now verboten. So how 'bout we do it the old fashioned way -- I'll start cutting off extremities, and you can use the red ribbon for a tourniquet. You never listen to me... I want a J.A. Henckels! "You sure have a long, shiny, smooth one!!!" Use this baby as a penknife, and you can write a realllllly binding contract! "Uh oh, we are in trouble. It reads "Property of King Arthur".